AT&T Galaxy S4 Owner: I don't know what happened to my Samsung Galaxy S4, which I bought from AT&T, it seems to be not responding to the power key. When I press the power button, it just doesn't do anything even if I long-press it. I don't know if this is an isolated issue or a common one but if you something that could solve this problem, I would love to read about it. Thanks. Verizon Galaxy S4 Owner: After I installed a certain application, my phone (Verizon Galaxy S4) started running very slow with freezes and lags. I wanted to do a reboot but the phone didn't respond to the power button. I pressed the power button more than a hundred times already as the problem happened yesterday but still the phone won't turn itself off. What should I do? · Your device's software (firmware) is not up to date. 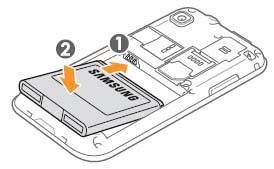 · You are using non-Samsung OEM accessories such as a battery or charger. · The device has been rooted and you have installed a custom version of the Android operating system. · Physical or liquid damage is present on the device. · Third-party application is causing an issue. · Device has no memory available and may be crashing due to insufficient available storage. 1. With the device still on, remove the battery for 30 seconds. After the time has elapsed, replace the battery and power on the device. 2. Check for any available software updates for your device at Samsung Support. 3. Verify that you are not connecting or using any non-Samsung OEM accessories with your device. Non-Samsung OEM accessories can cause unwanted behavior. Disconnect or remove any non-Samsung OEM accessories. 4. With the device plugged into OEM charger, hold down the Power key for 5-6 seconds and see if the device attempts to turn on or indicates it is charging. 5. If the phone continues not to respond when you press the power button, have an authorized technician check on it because it could be hardware / switch issue. In the U.S., customers who are experiencing inconvenience with their device can always request for a replacement unit. Send us an email at sebertech@gmail.com if you have problems with your phones and you don’t know how to fix them. We may not be the most knowledgeable people in the world but rest assured we will do our best to find solutions to your problems. We know people, that we consider experts as far as solving phone problems is concerned, that we could ask questions about things we don’t know about certain issues. On top of that, 3 of our bloggers are currently working full-time as phone technicians.